Last edit: July 04, 2018, 12:49:23 PM by Cryptov8! The fragmentation of cryptocurrencies across exchanges, the lack of education and understanding, high costs of crypto token transacting and the multitude of wallets available have all served to erect barriers against adoption for all but the most determined practitioners. Cryptov8 will remove barriers to use and incentivise early adoption by rewarding cryptocurrency holders in a similar way to fiat (currency that is declared by governments as legal tender). Cryptov8 will be launching a universal account and universal wallet that manages both FIAT and cryptocurrencies. Cryptov8 does not see itself as just competing with other banks, the established order and the newer digital ‘challenger’ banks. Rather we will draw upon the best corporate examples of customer service and use of technology, across other digital consumer champions, such as Alibaba, Apple, Amazon, Google, LinkedIn, WeChat and others. technology such as artificial intelligence, machine learning and blockchain give us an opportunity to serve the customer better by helping them improve their financial lives. For example, by intelligently predicting spending patterns and utilising more efficient services through new technology we will provide informed financial suggestions. 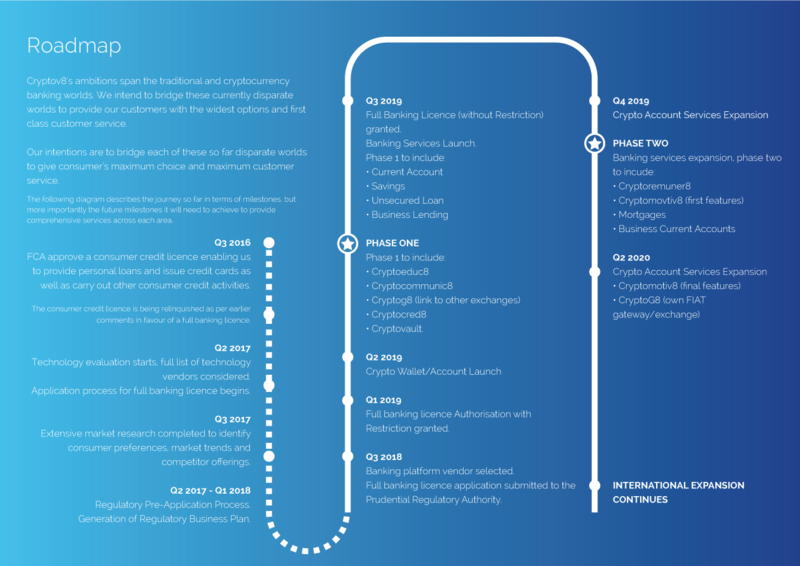 These technology enabling trends are supported by changes in regulation such as Open Banking and PSD2 that furthers customer choice, allowing Cryptov8 to interact and integrate with other market services, making sure customers have access to the best of breed service options in the banking and wider commercial ecosystem. The UK’s Open Banking initiative, Europe’s PSD2 initiative and the global push to open banking standards promises to transform the banking sector and will allow FinTech’s and other new operators to offer services to banking customers. Cryptov8 will capitalise on these changes by partnering with appropriate organisations to extend the list of cryptocurrency and blockchain services available to our customers, ensuring we become the ‘one stop shop’ for anything crypto related. We will also offer our capabilities via decentralised apps to promote crypto commerce services across the market. 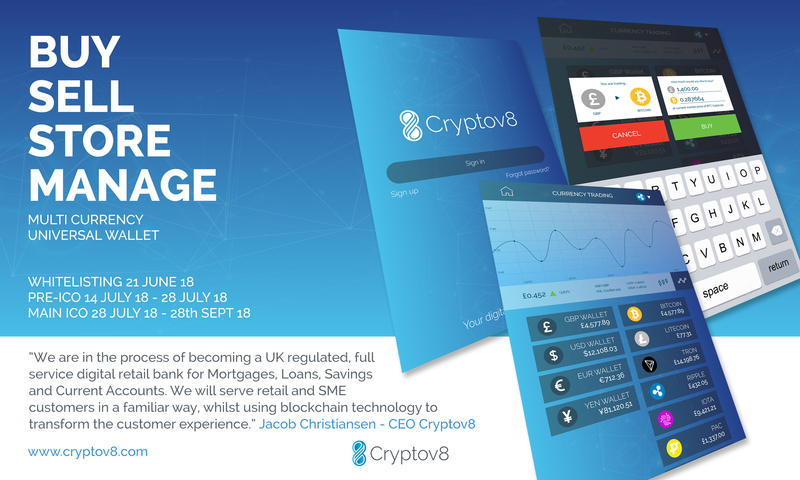 Cryptov8, plan to be enviably placed as a UK regulated bank to merge the UK’s best practice regulation of an established market with the emerging crypto market that has yet to see prescriptive best practice. Cryptov8 will look to adapt and apply UK regulatory best practices to lead the way in protecting the customer from the pitfalls for the unwary and inexperienced moving into the cryptocurrency world. We will be a global presence in the traditional and cryptobanking industry. 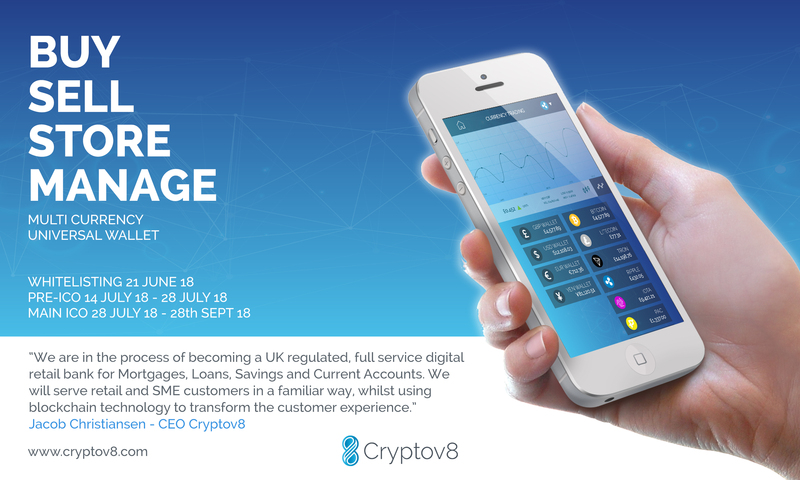 Cryptov8 will apply its UK knowledge and experience not only to cryptobanking, but to all future geographies and markets it aims to serve. Cryptov8 believe we are perfectly placed to be a responsible custodian in the cryptobanking market and will lead by example in serving and protecting our customers. The cryptocurrency market is fragmented and difficult to navigate for the uninformed. Exchanges are many, with coins or tokens distributed amongst them. Fiat gateways often make it hard to obtain a specific coin without buying another coin on the way through and wallets are numerous and sometimes confusing for the consumer. This creates a real barrier to entry and additional and unpublished transaction cost for many potential investors. Some banks demonstrate a disregard for the evolution of cryptocurrency by barring fiat conversion payment mechanisms, dissuading customer participation. If nothing else this serves to indicate the competitive threat the existing banking sector perceives to their proprietary money exchange and transmission services. Cryptov8’s intention is to reverse the existing banks quasi monopoly on money remittances’, We will offer our customers easy, cheap or free access to the cryptocurrency market. And we will incentivise participation through our tokens and offer other discounted banking services for those participating in the cryptocurrency market. We will provide educational material to help people enter the market and allow customers to use tokens to offset the cost of courses such as those provided by Udemy and others. Additionally, we will offer a help assistant for customers as they interact with the bank in the form of a cognitive learning bot. The bot will be configured to assist customers with questions and will build any appropriate account applications in the background, giving customers the opportunity to interact with the bank in a chat window whilst having the paperwork built as an output. At the outset, we realised that it was important for us to define and control the customer journey and our technology selection criteria and evaluation process has been conducted with those aims in mind. Cryptov8 does acknowledge that for many of the peripheral services and in particular those associated with the cryptocurrency market and Blockchain that we will need to collaborate with a series of organisations to deliver the best service and best value for our customers. Therefore, open banking and the use of Apps and APIs will form a key aspect of the overall solution we build. 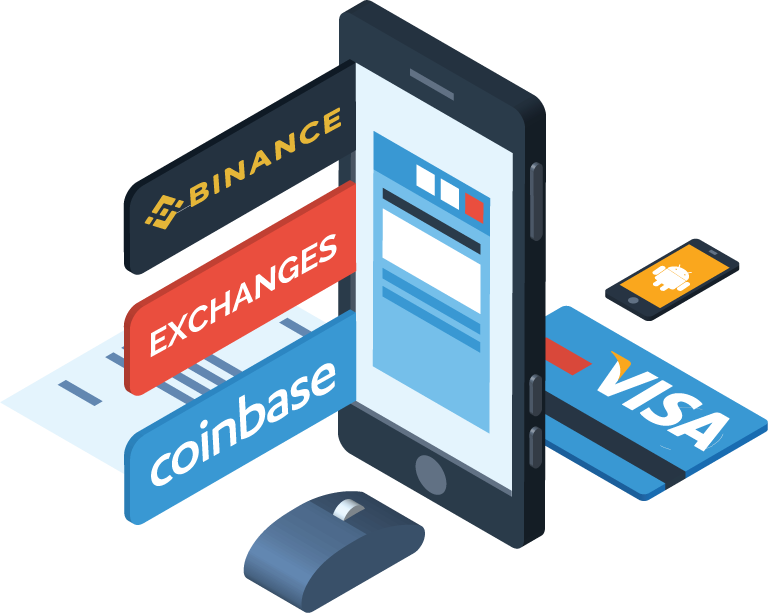 One example, is that we will need to integrate with many FinTech organisations who can deliver far more compelling solutions to business or customer problems than Cryptov8 could support by itself. Our collaboration and use of open banking is fully supported by the Payment Services Directive 2 (PSD2) and the UK’s own OpenBanking initiative. Blockchain as a technology is built using the same principles. We believe by embracing the technology and this regulation, it will allow us to offer the best services to market. Cryptov8 is engaged with a number of technology suppliers to deliver on this promise and we are excited by the partnerships and joint ventures that are being considered albeit initiatives that we are unable to elaborate on at this time due to non-disclosure arrangements. Our strategic partnerships will be released to the public once legal formalities have been completed and will be announced across all media platforms throughout the lifecycle of the bank launch. Last edit: July 04, 2018, 12:51:09 PM by Cryptov8! Universal wallet and combined account sounds interesting! Genuinely excited about this ICO. They're going to offer a much needed solution to the digital banking and crypto space. Very interesting - will follow this one closely. Please join us on our telegram channel for information and updates. Information on the bounty campaign and referral bonuses coming shortly!!! Whitelist now for your unique referral code!!!!!! Hey. I am quite new to this. Does this look interesting to the more experienced ICO crowd? The advisors consist of Global corporate lawyers, seasoned banking professionals, regulatory guru's and blockchain evangelists. How long will it take for them to get an actual banking licence? Quicker than most, a regulatory business plan has already been created and many of the team have previous experience in setting up new challenger banks. Unlike many ICO's this one will follow through with its promises. Ethos have been promising a universal wallet and account for months, we have the technology and team to deliver it.